Greek stocks plunge on concerns about banks, political instability. Greek stocks went into a free fall after ratings agency Fitch issued a warning about its banks at a time when the country is already on the verge of a political crisis. 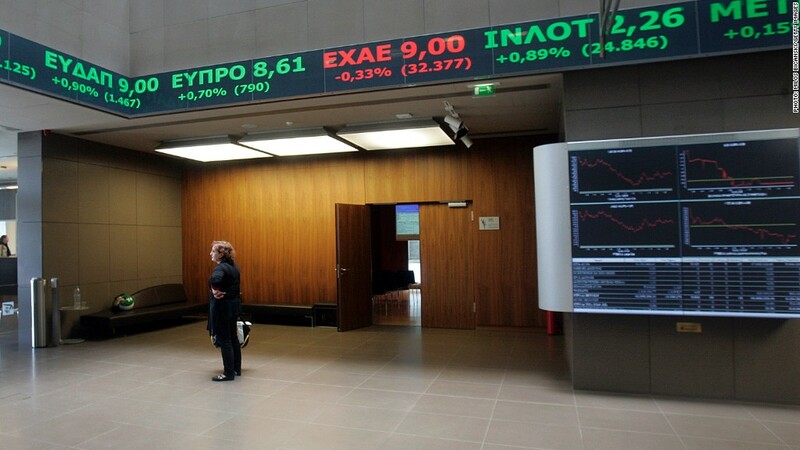 The benchmark stock index in Athens fell over 10% before recovering a little to close down 6.25% on Wednesday. Shares of Greek banks were among the hardest hit, with the National Bank of Greece (NBG) falling as much as 13% at one point. The selloff came after Fitch said Greek banks remain fragile despite improving their balance sheets and showing progress on restructuring plans. The ratings agency said upcoming stress tests by the European Central Bank could show additional shortfalls because of problem loans at various banks, including National Bank of Greece, Piraeus, Eurobank and Alpha. The warning comes in the midst of political uncertainty. The Greek government could face early elections in February if lawmakers cannot agree on a candidate for president soon. There is also fears that Greece won't be able to exit its bailout agreement with the International Monetary Fund ahead of schedule, as some officials had hoped. Costs to borrow climbed sharply, with the yield on Greece's 10-year bond rising to 7% Tuesday, the highest level since March. It's been a rough day for stocks across Europe. Stocks in Germany and France were down more than 2%, while the market in London declined 1.7%. U.S. markets also opened sharply lower, with the Dow Jones industrial average falling more than 350 points after the opening bell. The selling abated, but shares on Wall Street remain under pressure. Overall, investors have been rattled by a host of ongoing concerns, from the spread of Ebola and the conflict in Syria, to signs of a global economic slowdown and uninspiring corporate earnings.